Kindness. You thought I was going to say long eyelashes, didn’t you? Nah. Those are fun, too, but I’ll tell you something. McIrish has killer eyelashes, but it was him telling me (on our first date) how he rescued a kitten during a thunderstorm that made me start naming our babies. Competence. I’m not talking about the ability to change a light bulb or whip up dinner, though those things are also nice. I mean, the ability to do the right thing at the right time. When to just listen, or showing up at the exact right moment, or knowing when to take my—I mean, her—hand. Sense of Humor. Laughter and love both relieve stress and elevate heart rate and contribute to longevity. And it’s intimate, too, isn’t it? It’s like a secret side of yourself, revealed to someone else. He made you laugh. He gets you. Honesty. You can’t get very far in a relationship if you don’t trust your man. And once that trust is broken, I wonder if it ever can be repaired. What do you think? Appreciation. A guy who appreciates you—and shows it, through a smile, by saying thanks, sometimes just by a look…it’s so lovely to be acknowledged, whether it’s for doing something great or simply for being special. Those are the real reasons I fall in love with a hero. The long eyelashes and broad shoulders are just window dressing. Laura Moore ( www.lauramoorebooks.com ) Laura has also created a RARM essay and content you can read here. Huntley Fitzpatrick (www.huntleyfitzpatrick.com ) Find Huntley’s RARM essay and content on her Facebook page on Aug 1. We’ll post it here when it finds an internet home. As for my journey to getting started, it was simply the right time. I felt like writing a book had been lurking around the edges of my life for a while, but I had other things to do first. When the time came, things went in a pretty straightforward fashion: I finished a manuscript, got an agent, and she made a sale. I’ve been under contract ever since, which is pretty amazing to me. I never thought I’d write five books, but here I am, working on #14. The book that changed my life was Gone With the Wind. Simply stated, it was the first book that broke my heart, and I understood the power behind a great book…and how much they mean to us in tough times. Kristan is generously donating one set of her Blue Heron Books—The Best Man, The Perfect Match and Waiting On You—to one lucky winner, domestic only (apologies to international readers). Entry form at the bottom of the post. Good luck! 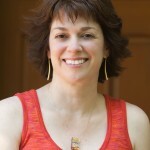 Bio: Kristan Higgins is a New York Times and USA TODAY bestselling author of a dozen romantic comedies. Her next book, IN YOUR DREAMS, comes out in September. Visit her website at www.kristanhiggins.com.